Designed to be an excellent assistant to anyone who needs to control computers and block unwanted activities! With the HT System Administrator unique fetuses, you can block or limit virtually everything on the computer. Review detailed reports of visited websites, launched applications and time spent on computers. Each action can be performed remotely with a couple of clicks. No skills or computer knowledge are required. 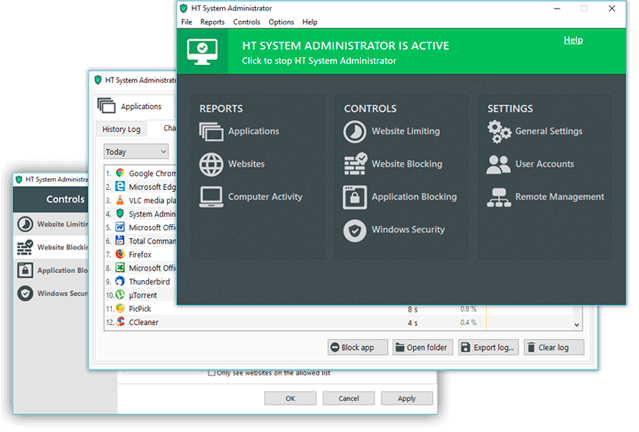 HT System Administrator is a unique application to control computers and block unwanted activities. 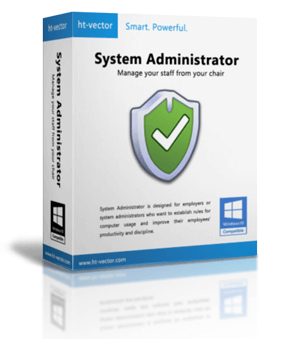 It's an excellent assistant to system administrators or anyone who needs to manage computer usage. 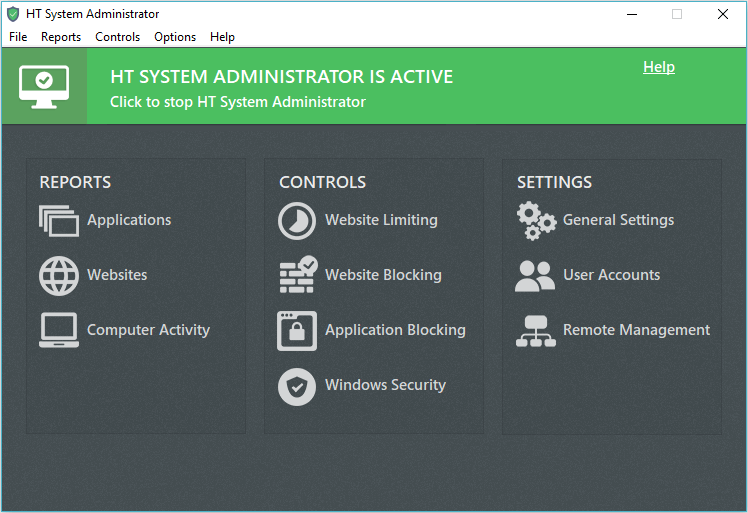 Once installed, HT System Administrator can restrict access to games, messengers, browsers and other apps on your computers. With the powerful Internet filter, HT System Administrator can block websites and inappropriate content. The detailed reports show computer usage statistics. No skills are required to control your computers as a system administrator. Increase productivity and lock time-wasting distractions with HT SysAdmin. 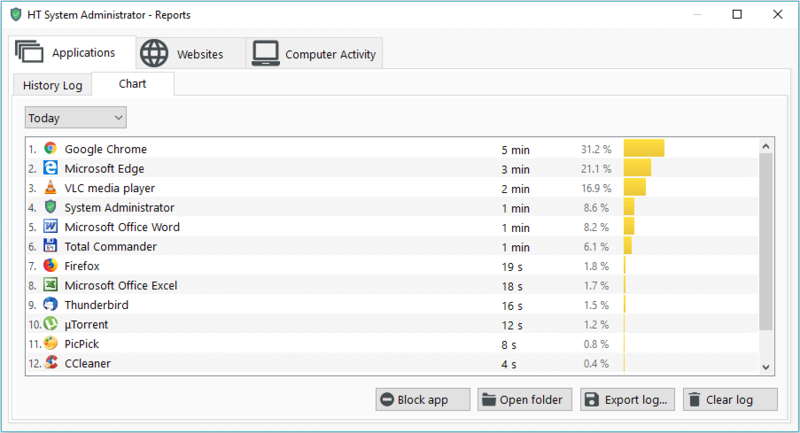 Monitor computer usage - sites, applications and etc. 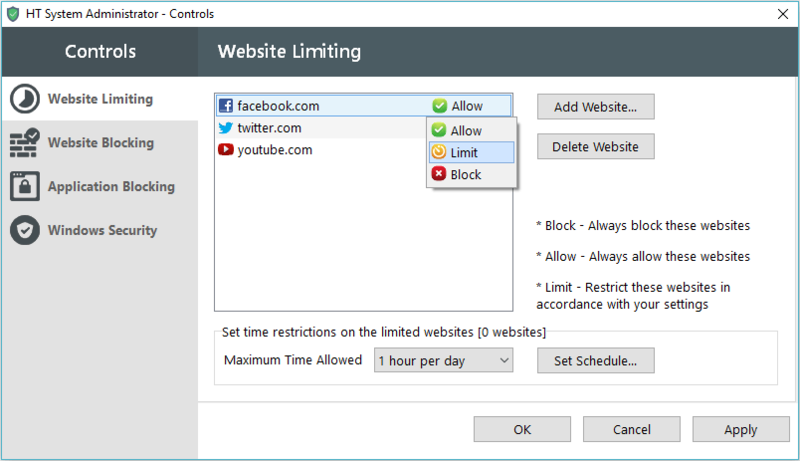 Block or limit time on any website. You can block certain websites by URLs, keywords or entire categories such as adult content, social networks, etc. Browser type and version make no difference. Do you prefer to block all websites and give access only to sites needed for work? Entrust this task to HT SysAdmin. Add your list to the program. Any site not from the list will be blocked. 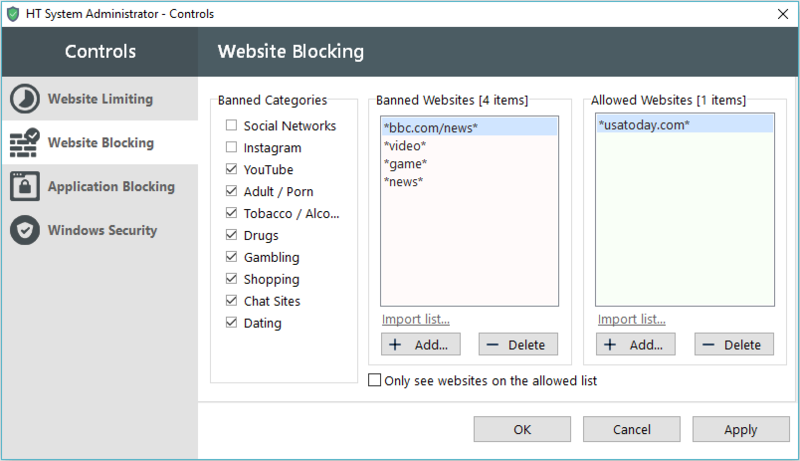 You can block any program from launching on your computer in a few clicks and even the most computer-savvy users cannot circumvent the ban. Block games, messengers, chart and even browsers. 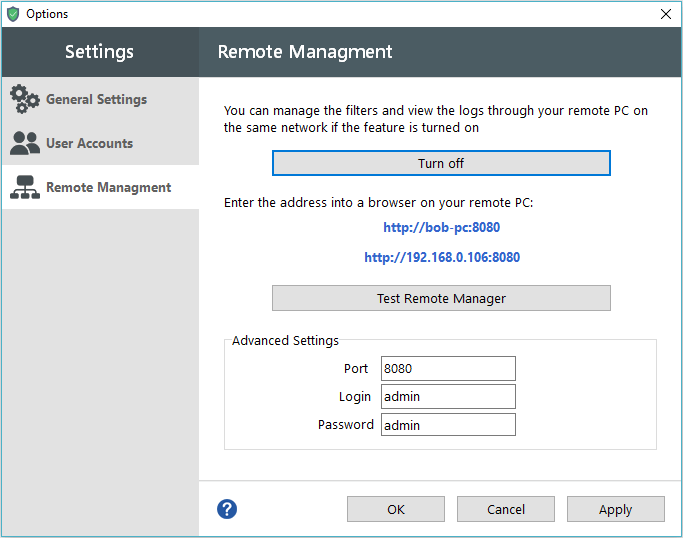 Rely on HT System Administrator if you need to disable important Windows options such as Task Manager, Control Panel, etc. So users cannot access or change them. HT System Administrator provides detailed statistics of computer use. You can view visited websites, launched applications, time spent on the computer, blocked activities. That runs like clockwork. I have used HT System Administrator for several years. It is an indispensable at work app. An intuitive interface and the feature set is great for working with websites and programs. Works smartly. Does not take much space. I advise everyone to use it. You will be stunned by its features. I cannot call myself an advanced user. However, when my kids got a computer, I had to join ... HT SysAdmin is seemed to me the most simple and convenient. You can block websites immediately and reliably without really going into the details. The logs of websites are very useful to me. You can view how much time users stayed on a site or an app. HT System Administrator is really worth! That is a good helper. I have used the program quite a long time, and I know that HT SysAdmin is a handy thing! This program is divided into seven sections. 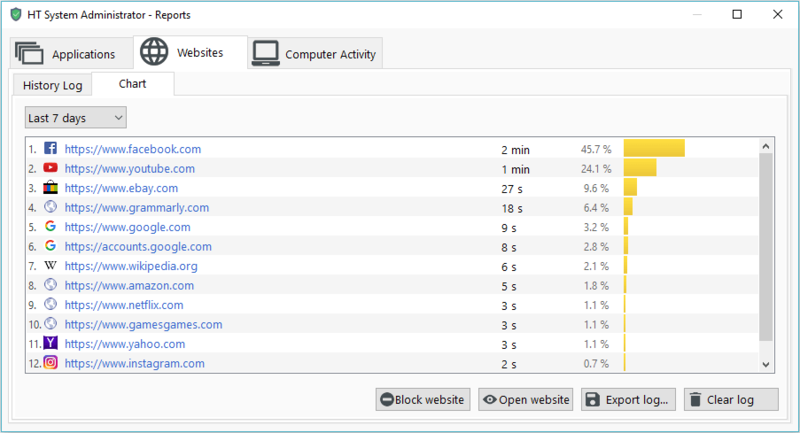 1 - the block websites tab (you can block categories or add URLs). 2 - the lock apps tab (the same). 3 - logs. 4 - the remote settings. HT System Administrator helped me increase productivity since all entertainment was blocked on my computer. Install HT System Administrator on your computer(s). Easily set the filters to block/limit unwanted activities and disable threats. 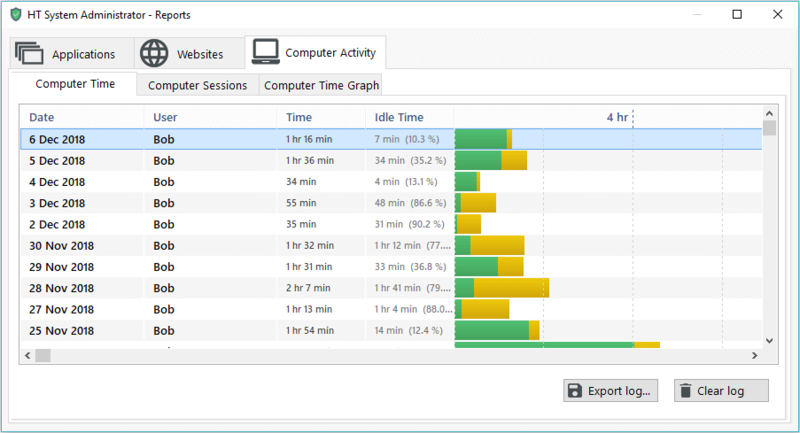 Manage computers and view reports remotely as simply as possible.